My research focus on the ways that the Black Middle Class are civically engaged, with civic engagement referring to any voluntary activity focused on helping others in support of political, social, and community gains that is motivated by trust, cooperation, and civil respect for one another. I am a specialist in race, class, civic engagement, and the Black Middle Class. I conduct research with both qualitative and quantitative methodology. I have experience using MaxQDA and Stata software. I have a commitment to conduct research that challenges assumptions about who is included when we talk about race, class, or civic engagement. My trajectory of research will examine the overlapping relationships between Black Middle Class voluntary organizations and community involvement. My dissertation tentatively titled "Be The Movement: A Study on Black Middle Class Civic Engagement," addresses the overarching question, how are members of the Black Middle Class civically engaged? In order to uncover the nuanced relationship between the members of the Black Middle Class and civic engagement, I conduct a theory building study that synthesizes concepts from social movements, civic engagement, and race theory. 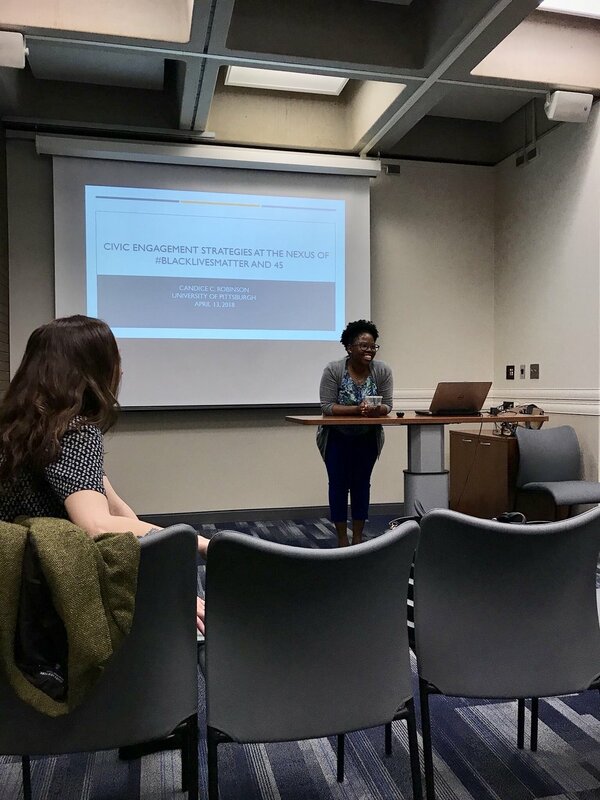 Similar to other conceptualizations of activism as democracy, my dissertation frames the concept civic engagement as an everyday form of activism that extends the goals of a social movement with a focus on the Black Middle Class in response to gaps in the literature. The project sheds light on how voluntary organizations survive in times of abeyance and heightened protest through their memberships and in turn how those members understand and use their roles as volunteers as part of their identity and everyday life. This study involves mixed methods using survey level data and an extended case study on the members of the Black Middle Class voluntary organization, National Urban League Young Professionals (NULYP), an auxiliary group of long-standing civil rights organization the National Urban League (NUL). Buggs, Shantel Gabrieal, Regina Hamilton, and Candice C. Robinson, (Forthcoming)* “#CarefreeBlackGirls? : Creating On-Line Community as Means of Survival” Deliberate: The Experience of Women of Color Graduate Students Anthology. Candice C. Robinson. “Will Moving Beyond Positivism Move Yield Diverse Thought?” In preparation for submission to Journal of Critical Realism. Junia Howell and Candice C. Robinson. "Myth of the Black Ghetto"
“In Sisterhood: the Women's Movement in Pittsburgh"